This slightly sweet red wine will feel on your lips like your first kiss. Savor the deliciousness and depth of this wine. 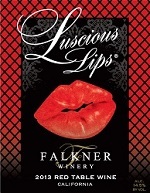 Enjoy this wine warm as “Hot Lips’, cold as “Sangria”, or room temperature. Take part in the fun and share this tasty wine with your closest friends. And if the mood suits you, come back for more.